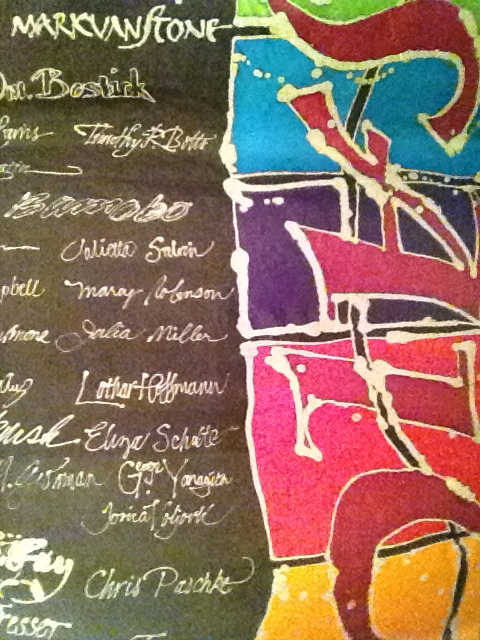 This beautiful hand-painted silk banner was given to me at the end of Mosaic, the 1992 International Assembly of Lettering Artists in Michigan. I was very fortunate to have directed this exciting event. 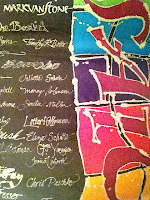 This wonderful banner has the signature of each instructor at the event and I cherish it. The only problem is that it is so large, I had not figured out how I would use it. Yes! I even considered making it into something I could wear but didn't want to hide any portion of it. It is now in use!! My workshop is a nice working space for me and for classes but the ceiling is "open," unfinished. Now one large section of the open space is draped with the banner and I LOVE it! Of course, a few times when I walked in that area, I found myself ducking - haha...I just wasn't used to have anything over my head there! !